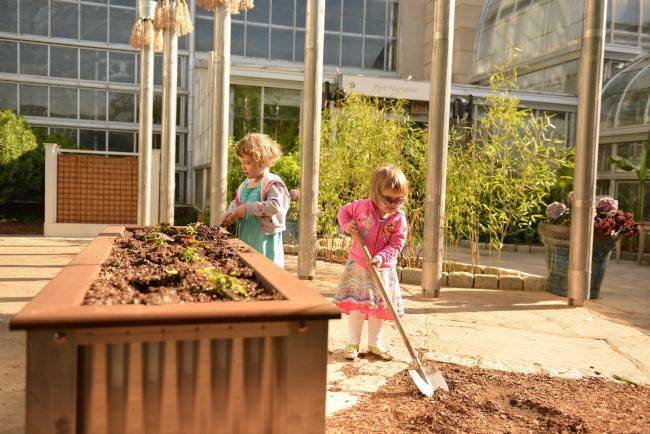 The United States Botanic Garden (USBG) and Architect of the Capitol (AOC) updated the Children's Garden in the USBG Conservatory. The Children's Garden is a favorite exploration space for families from around the D.C., Maryland, and Virginia area and visitors with children from across the globe. Improvements added a new platform climbing structure, created a new kiwifruit vine tunnel, added a new digging area, expanded seating areas, and added additional shade structures. Spaces to dig, explore, plant, water, and care for plants remain in the updated garden. Come explore the updated Children's Garden! The arrival of warm weather and spring blooms brings out the kid in all of us, and there's no better place for kids and their parents than the U.S. Botanic Garden. Explore the outdoor Children's Garden in the U.S. Botanic Garden Conservatory where kids can grow their imaginations while checking out a variety of colorful garden plants. The Children's Garden gives kids a chance to get hands-on in a garden where they can explore and use gardening tools and watering cans. When young children use their imaginations to relate to their surroundings, there is evidence that they are also developing a life-long affection for the natural world. Kids are invited to see what's in bloom and to gently touch and smell the plants in the Children's Garden. Watch your kids relax, discover and reawaken their sense of curiosity!